I love hand crafted jewelry so I was immediately drawn to the collection designed by Nija at Bijou By Nija! With jewelry for men, women and girls there is sure to be the perfect piece for your own collection or something special to give as a gift. There is a wide selection of bracelets, earrings, necklaces and jewelry sets available in the Bijou By Nija shop at Etsy. If you are looking for something extra special you can even contact the designer for a custom order too! I am thrilled with the results of my custom jewelry set designed by Nija. The Red and Fuchsia Rhinestone Heart Pendant with Matching Earrings are absolutely lovely. It is obvious that there was a lot of attention paid to every detail in this set. The necklace is the perfect length and features a steel chain with a toggle front clasp. The flower design set into the rhinestone heart pendant is stunning and I really like the contrasting colors which makes it a real statement piece. The matching earrings are so feminine and I love the faceted fuchsia glass beads set against the silver pewter and accentuated by sparkling Swarovski crystals. 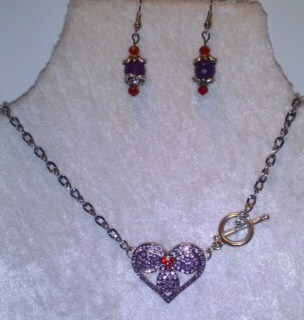 This is a lovely set that I will be proud to wear for Valentine’s Day or to a romantic dinner date with my husband! I also like that there is a selection of skin sensitive friendly bracelets. My daughter, Hannah has eczema so a lot of other jewelry irritates her skin. It is nice to know that there are available options at Bijou By Nija made of macramé including the Women’s Hello Kitty Macrame Bracelet ($18) and the Pave Macrame Bracelets ($18). My daughter would love the Little Girls Hello Kitty Macrame Bracelet which fits children ages 3-12 and is attractively priced at only $12 for this pretty piece! There are lots of great gift ideas for Valentine’s Day for moms, girls and even the men’s bracelet. A few of my favorites include the Pink Rhinestone Heart Necklace Set ($25) and the Memory Wire Bracelet ($7). I appreciate that this jewelry designer stands by her collection because each piece has a lifetime backing for normal wear and tear with free replacement parts and the shipping is FREE! You are invited to visit Bijou By Nija to browse the entire jewelry collection….which pieces are your favorites? I love all but I especially think that the memory wire bracelets are the best! My daughter would love the Hello Kitty macrame bracelet. My absolute favorite is the Turquoise Shell and a Plum Glass Pearl Necklace Set. My favorite piece of jewelry is the Onyx and Zebra Acrylic Necklace Set. I like the Turquoise shell and a plum glass pearl necklace set. i love the Plum and Pink Czech Glass Necklace Set. Memory wire bracelets is so cute with the gold flower beads on it. I like the Rose Gold Necklace and earrings. I like the Pavre Macramé bracelet. My favorite piece from BijouByNija is the Wood and Orange Gemstone Set. My favorite piece is Gold Tone Rhinestone Ceneterpiece Macrame Bracelets. I like the Macrame Bracelets (Black, Grey, and Turquoise). those would look lovely on my wife. I love the Macrame Bracelet! So pretty! I like the pink & black Macrame bracelet. 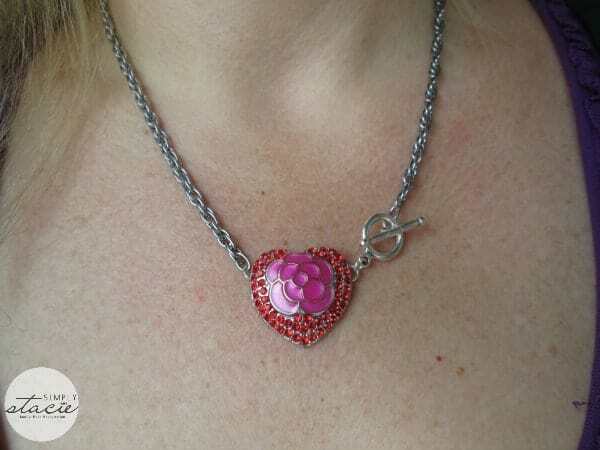 I love the pink rhinestone heart necklace. Agate Pendant Set( Sterling Silver Chain). My favorite is the Multicolored Tiger Eye and Onyx Necklace set. I also love their Plum and Pink Czech Glass Necklace Set! I love the Beaded Weaved Blue Czech Glass and Black Necklace Set! 🙂 so pretty.